I met CrossFit at the University camp for the first time. What was my first impression? I competed in some of them or just worked out, but my main goal was being good in all of them. This is a must have for me and i accomplished it in crossfit completly. And what did I like? The community. If you go to the gym, you not only just train and finish, but train with your friends, you feel like a king, even if you are out of your stamina at the end (You will be, i guarentee). But you still ’gonna leave the gym with a huge smile on your face. My weekend classes are for both, begginners and advanced CrossFit lovers. 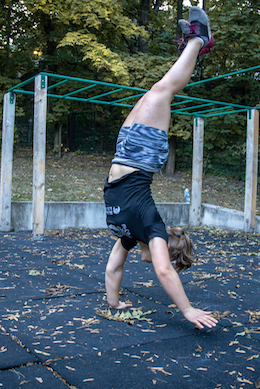 Do not hurt me before - as a student at the TF Physical Education College – If you had any injury before, don’t be affraid, you can still do Crossfit with my assistance, since im learning recreational studies at the University – I can help you as a personal trainer as well. Since I was a kid di dall kind of sports, started with skiing, then I did everything from ball games to swimming, wall climbing.I was seriously involved in sailing and now im doing Ultimate Frisbee as well.